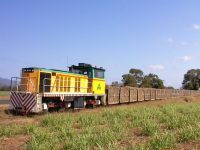 The investment by the sugar industry in cane railway networks is significant. No other agricultural industry makes a similar contribution (between $1.5 billion and $2 billion in replacement value) to reduce road traffic through use of private transport infrastructure, such as cane railways. Longest run: 119 km, typical run: 13 kms up to 35 kms. Train length: up to 1 kilometre. Public and employee safety is a priority every crushing season for sugar milling companies. Public awareness campaigns help to minimise any safety risks. MSF Sugar – have you seen a cane train?